Champagne flute glass handcrafted with “Big Flower” engraving. Processing time: 8 working days. Handcrafted products made when ordered. Shipping time: from 2 to 6 working days depending on your area. Delivery in 10-14 working days after online order. You will receive photos of each stage of the manufacturing process. 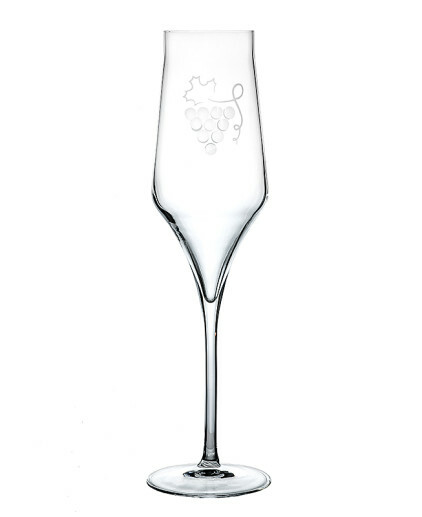 Champagne flutes are in ultra-clear transparent and safe crystal. This stunning crystal allows you to fully appreciate the value of your wine. Each and every flute is crafted by hand. This flute has a special ‘Big Flowers’ engraving, which is a frosted rose with stylized petals and stem which climbs up the glass bowl. You will receive an email with photos of each stage of the manufacturing process. We will repair your item free of charge. Although it’s often tempting to use a dishwasher , the best way to wash your Crystal glasses is to hand-wash them. 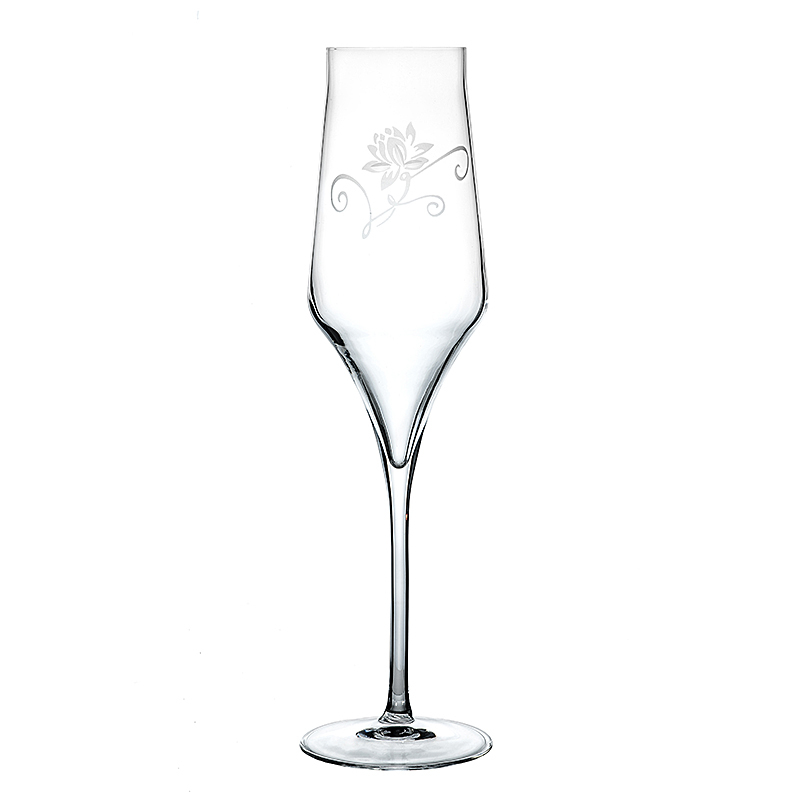 Champagne flute glass handcrafted with “Bunch of Grapes” engraving. Processing time: 8 working days. Handcrafted products made when ordered. Shipping time: from 2 to 6 working days depending on your area. Delivery in 10-14 working days after online order. You will receive photos of each stage of the manufacturing process. 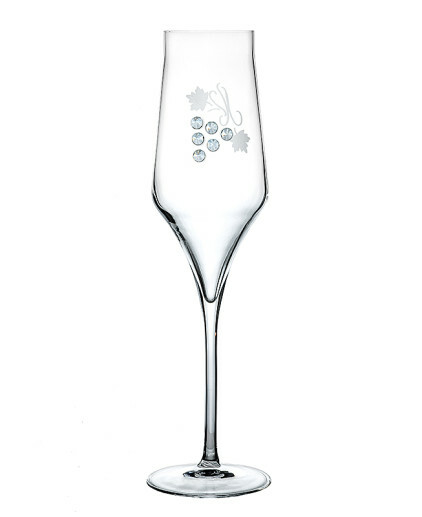 Champagne flute glass handcrafted with 'Swarovski Grapes' engraving. Processing time: 8 working days. Handcrafted products made when ordered. Shipping time: from 2 to 6 working days depending on your area. Delivery in 10-14 working days after online order. You will receive photos of each stage of the manufacturing process. 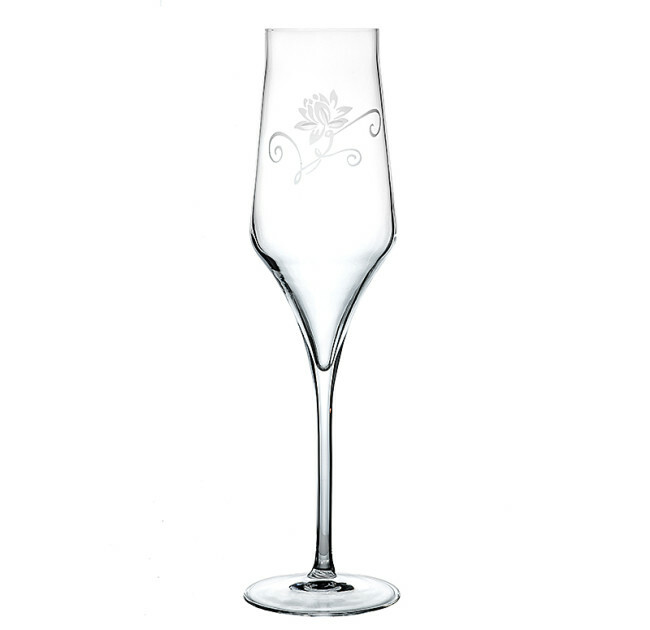 Champagne flute glass handcrafted with “Flower” engraving with Swarovski crystals. Processing time: 8 working days. Handcrafted products made when ordered. Shipping time: from 2 to 6 working days depending on your area. Delivery in 10-14 working days after online order. You will receive photos of each stage of the manufacturing process. Champagne flute glass handcrafted with 'Swarovski Skull' decoration. Processing time: 8 working days. Handcrafted products made when ordered. Shipping time: from 2 to 6 working days depending on your area. Delivery in 10-14 working days after online order. You will receive photos of each stage of the manufacturing process. Ours is a 'third-generation company, founded in 1940. Adriano Piatti with the help of a few collaborators seeking, amid a thousand difficulties, to bring out his skills as a craftsman of glass. Over the decades, the guidelines aim of ensuring high quality and process design objects incomparable have been successful, acquiring new prestigious customers in Europe where the "Made in Italy" has always been synonymous with refinement and quality.